The best way to access our building is to enter from Milton and Greenville. Head west on Milton, then turn left at the dead-end. 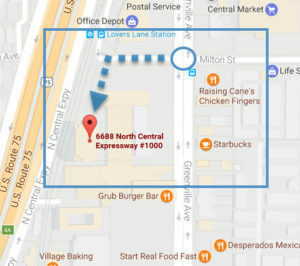 Continue straight past the first building and into the visitor’s parking garage located on the bottom floor of 6688 North Central Expressway. Access the Lobby through the elevator. We are located on the tenth floor.